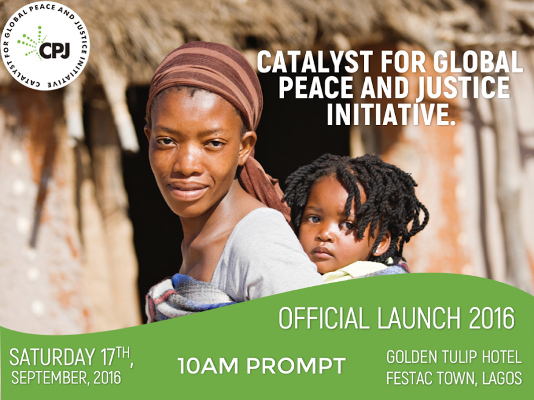 Ezekwesili, a former vice president of the World Bank will be the chairperson at the launch scheduled for Saturday September 17, 2016 at Golden Tulip Hotel, Festac, Lagos; while Amadi will deliver the keynote: Christianity and the Struggle for Social Justice. Set up by committed and credible Christian leaders in Nigeria desirous of peace, prosperity and social justice for all nations, the CPJ will focus on how human governance can protect citizens, punish those who do wrong and promote the general welfare of the people. The CPJ’s vision is to ensure a world of harmony and abundance, while its mission is to empower citizens to work for peace and social justice. Its focus areas of activities shall be Good Governance, Conflict Resolution, Social Justice, Humanitarian & Welfare Services and Social Services. The CPJ intends to contribute to global peace initiatives and help provide social services in all crises - ridden nations of the world.